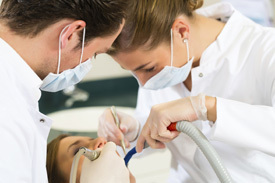 The Dentists at Anchorage Dental Care offer wisdom teeth extraction under oral sedation. In most cases there’s no need for general anaesthetics with more costly surgical procedures and longer recovery times. We’ll take our time to extract your wisdom teeth gently to minimise your discomfort. Our experienced team can take care of your needs. At your first appointment, we’ll take a panoramic, 360-degree scan of your jaw. This scan allows us to see exactly where your wisdom teeth are and how best to remove them. We’ll fully describe the procedure and have you sign a consent form showing that you’re fully informed before proceeding. You’ll have the chance to ask any questions so you can proceed feeling comfortable. You’ll have taken the oral sedative two hours before you arrive for the extraction. The sedative allows you to be awake but fully relaxed. It has the added benefit of retrograde amnesia, so you can’t remember the procedure clearly and are in a dream-like state. The sedation can take several hours to wear off, so you’ll need someone to look after you for the rest of the day. You’ll continue taking the antibiotics and anti-inflammatories in addition to painkillers for the next few days. Problems with your wisdom teeth begin in your teens and twenties. We recommend that you have them removed earlier because as the wisdom teeth mature, the roots become more developed and they grow larger. Earlier extractions are easier and you’ll have better results with less recovery time and less possibility of complications. Your insurance may cover your extraction. At the consultation appointment, we’ll give you a formal quotation of the cost. You can then talk to your insurance company to determine how much you’ll receive back from them. Our highly trained staff will put you at ease. Contact us today to schedule your appointment.